Still one of David Bowie’s best-known songs, “Space Oddity” was a largely acoustic number augmented by the eerie tones of the composer’s Stylophone, a pocket electronic organ. The title and subject matter were inspired by Stanley Kubrick’s 2001: A Space Odyssey and introduced the character of Major Tom. Some commentators have also seen the song as a metaphor for heroin use, citing the opening countdown as analogous to the drug’s passage down the needle prior to the euphoric ‘hit’, and noting Bowie’s admission of a “silly flirtation with smack” in 1968.His 1980 hit “Ashes to Ashes” declared “We know Major Tom’s a junkie”. “Unwashed and Somewhat Slightly Dazed” reflected a strong Bob Dylan influence,with its harmonica, edgy guitar sound and snarling vocal. “Letter to Hermione” was a farewell ballad to Bowie’s former girlfriend, Hermione Farthingale, who was also the object of “An Occasional Dream”,a gentle folk tune reminiscent of the singer’s 1967 debut album. “God Knows I’m Good”, Bowie’s observational tale of a shoplifter’s plight, also recalled his earlier style. “Cygnet Committee” has been called Bowie’s “first true masterpiece”.Commonly regarded as the album track most indicative of the composer’s future direction, its lead character is a messianic figure “who breaks down barriers for his younger followers, but finds that he has only provided them with the means to reject and destroy him”.Bowie himself described it at the time as a put down of hippies who seemed ready to follow any charismatic leader.Another track cited as foreshadowing themes to which Bowie would return in the 1970s, in this case the fracturing of personality, was “Janine”, which featured the words “But if you took an axe to me, you’d kill another man not me at all”. 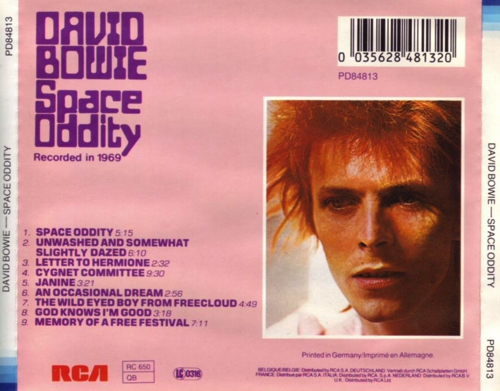 The Buddhism-influenced “Wild Eyed Boy from Freecloud” was presented in a heavily expanded form compared to the original guitar-and-cello version on the B-side of the “Space Oddity” single; the album cut featured a 50-piece orchestra and was also notable for Mick Ronson’s debut on a Bowie record, playing uncredited guitar and handclaps midway through the song.“Memory of a Free Festival” was Bowie’s reminiscence of an arts festival he had organised in August 1969. Its drawn-out fade/chorus (“The Sun Machine is coming down / And we’re gonna have a party”) was compared to The Beatles’ “Hey Jude”;the song has also been interpreted as a derisive comment on the counterculture it was ostensibly celebrating.The background vocals for the crowd finale featured Bob Harris, his wife Sue, Tony Woollcott and Marc Bolan among other people.In 1970 Bowie cut the tune in half for the A- and B-sides of a more rock-oriented version featuring the band that would accompany him on The Man Who Sold the World later that year: Mick Ronson, Tony Visconti and Mick Woodmansey – an embryonic form of Ziggy Stardust’s Spiders From Mars. Held to be “the first Bowie album proper”,and his first deemed worthy by record companies of regular reissue, David Bowie featured a notable list of collaborators, including session players Herbie Flowers, Tim Renwick, Terry Cox, and Rick Wakeman, as well as cellist Paul Buckmaster, multi-instrumentalist and producer Tony Visconti, and bassist John Lodge (not to be confused with The Moody Blues’ bassist of the same name). Before recording for the album commenced at Trident Studios, the song “Space Oddity” had been selected as the lead single based on an earlier demo.Tim Renwick, John ‘Honk’ Lodge, Mick Wayne and John Cambridge – all from the band ‘Junior’s Eyes’ – featured on the album sessions and briefly served as Bowie’s backing band for live appearances and on an October 1969 BBC Radio session.Visconti saw it as a “novelty record” and passed the production responsibility on to Gus Dudgeon.He thus produced all the songs on the album bar what would become, from its 1972 reissue onwards, the title track. Although the opening song had given Bowie a No. 5 hit in the UK earlier in the year, the remainder of the material bore little resemblance to it and the album was a commercial failure on its initial release, despite some decent reviews.However the November 1972 reissue, released in the wake of Bowie’s breakthrough The Rise and Fall of Ziggy Stardust and the Spiders from Mars and featuring a contemporary Ziggy photo on the cover, made No. 17 in the UK charts and No. 16 in the United States. 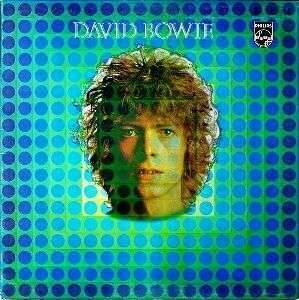 The original UK David Bowie LP cover artwork showed a facial portrait of Bowie exposed on top of a work by artist Victor Vasarely with blue and violet spots on a green background. The same portrait was used on the US Mercury LP Man of Words/Man of Music, but on a plain blue background. 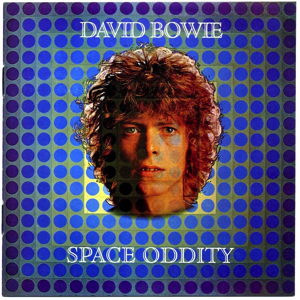 When the album was re-released as Space Oddity in 1972 by RCA, a more recent portrait from the Ziggy Stardust period was displayed on the front cover.For the 1999 CD reissue the original UK cover was restored, although the new title was added under the portrait to avoid further confusion. The 2009 40th Anniversary edition also uses the original UK cover, but reverts to the original green tint and ‘David Bowie’ title. 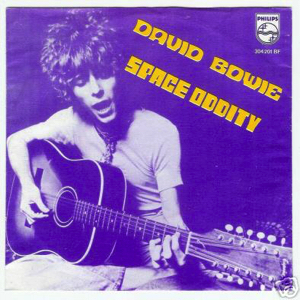 There was only one release of Space Oddity on open reel, in 1972 duplicated by Magtec, North Hollywood, CA 91605. This is a high speed 7.5 ips release. 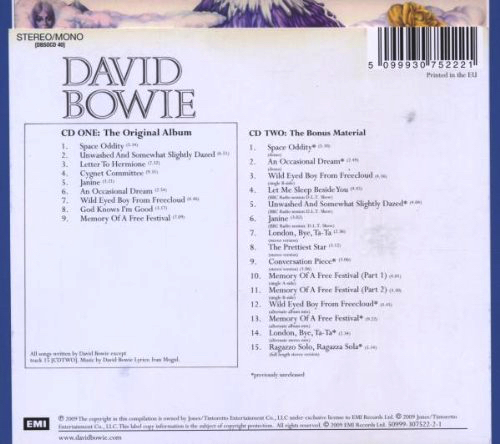 RCA is the only known company Bowie has been assigned to that released his albums in this format, and only in the US, though imports into other regions may have occurred. Space Oddity was first released on CD by RCA in 1984. In keeping with the 1972 RCA LP release, “Don’t Sit Down” remained missing. The German (for the European market) and Japanese (for the US market) masters were sourced from different tapes and are not identical for each region. In 1990, the album was reissued by Rykodisc/EMI with an expanded track listing including a restored “Don’t Sit Down” as well as “Conversation Piece” and the two-part re-recording of “Memory of a Free Festival” that had been released as a single in 1970. The album was reissued again in 1999 by EMI/Virgin, without bonus tracks but with 24-bit digitally remastered sound and retaining the original “Don’t Sit Down”. The Japanese mini LP replicates the cover of the original Philips LP. In 2009, the album was released as a 2CD special edition by EMI/Virgin as David Bowie with the original cover art, with the first disc containing nine tracks and the second disc a collection of unreleased demos, stereo versions and previously released B-sides and BBC session tracks. 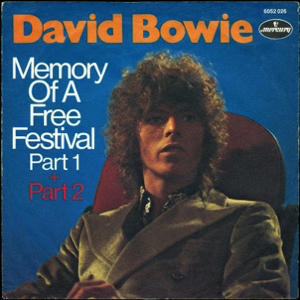 “Memory of a Free Festival” is a 1970 single by David Bowie. The song had originally been recorded in September 1969 as a seven-minute opus for Bowie’s second self-titled album (reissued as Space Oddity in 1972). It was reworked in March-April 1970 at the behest of Mercury Records, the label believing that the track had a better chance of success as a single than “The Prettiest Star”, released earlier in the year. Bowie and Tony Visconti roughly split the track in half, re-recording it so both halves could function as individual songs. A more rock-orientated version than the earlier album cut, this rendition marked guitarist Mick Ronson’s and drummer Mick Woodmansey’s studio debut with Bowie’s band, bringing together the line-up that would shortly record The Man Who Sold the World. Biographer David Buckley described “Memory of a Free Festival” as “a sort of trippy retake of the Stones’ ‘Sympathy for the Devil’ but with a smiley lyric”. The track was written as a homage to the Free Festival, organised by the Beckenham Arts Lab, which was held at Croydon Road Recreation Ground in Beckenham on 16 August 1969. Released in America in June 1970, it was commercially unsuccessful; only a few hundred copies sold. It was also issued in the UK, but was similarly unsuccessful.